Mr. Dave Marciano grew up in Massachusetts, and although no one in his immediate family fished, Dave was drawn to the sport, going to ponds with his mother and fishing for hours on end. When Dave was 9, his family moved to Beverly, MA, near the harbor. This gave Dave the chance to walk right down to the docks and fish whenever he felt like it. His lifelong passion for fishing was officially nailed down. He started earning a living in fishing while he was still in high school, working on the Yankee Fleet, a chartered vessel that did day trips for fishing and whale watching. After high school, Dave stayed on with this boat full time and even wintered with them in the Florida Keys, which he says was a much different experience than working the shores of Massachusetts. Eventually, Dave earned his captain’s license and went off on his own. He purchased his own boat, started his own commercial fishing business, and was eventually picked up as a star on a new fishing reality show. 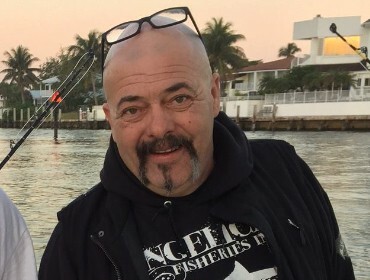 Captain Dave Marciano brought his skills and experience to National Geographic’s Wicked Tuna, a reality show that documents commercial fishing off the coast of Gloucester, MA, one of the most historic fishing towns in the country. Dave brings his personality, attitude, and competitive nature to the show, making it one of the most popular fishing shows around. In the show, Dave is seen fishing on his boat, the Hard Merchandise, with his nephew Jason and son Joe.